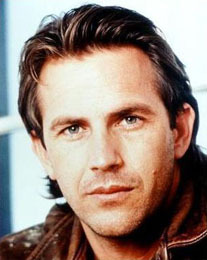 Kevin Costner is a lanky, likeably laconic movie star, best known for action hits like The Untouchables and The Guardian and colossal flops like Waterworld and The Postman. He won two Oscars as director and producer of the epic western Dances With Wolves. As a boy, Costner sang in his church choir, wrote poetry, and yearned to be an actor, but his high school did not offer drama classes or stage plays. His father was a ditch-digger who urged his son to get a good education and a better job, so Costner went to college and majored in business, but took acting lessons in the evenings. At 19, he lucked into a small role in Sizzle Beach U.S.A., a soft-core farce that was not even released until 1986, when Costner's name made it suddenly marketable. Meanwhile, Costner got his degree and took an office job, while occasionally acting at a local playhouse. Returning from a vacation in Mexico, Costner met actor Richard Burton on a plane flight and cajoled the superstar for advice. Burton told him he would never make it as an actor unless he dropped everything else to pursue acting. Costner has said that his wife was furious when he came home and announced he was quitting his steady day job to become a professional actor. They resettled in Los Angeles, where Costner auditioned for everything but was hired for nothing. He worked as a truck-driver, a Hollywood tour guide, and piloted the Jungle Cruise ride at Disneyland, where his wife wandered the grounds as Snow White. He was an extra in Ron Howard's Night Shift, and he was the dead friend in the coffin whose funeral propelled the plot in The Big Chill, but Costner's face was not even seen on screen. His breakthrough was a supporting role as Scott Glenn's endearingly goofy brother in the wild western Silverado, and he solidified his star status as Elliot Ness in The Untouchables with Sean Connery and Robert De Niro. Among his many hits and bombs, Costner has made three movies about baseball, playing the washed-up minor-leaguer in Bull Durham with Susan Sarandon, the farmer whose corn field spawns the ultimate fantasy league in Field of Dreams, and a veteran pitcher having a pretty good day on the mound in For the Love of the Game. He also played a paunchy, retired ballplayer in The Upside of Anger with Joan Allen. Costner has invested over $20M in Ocean Therapy Solutions, a company that manufactures machines which, at least in demonstrations, are capable of removing about 97% of oil from water after oil spills. The machines work by spinning the contaminated water in centrifuge to separate the oil from the water. In the wake of BP's massive 2010 oil gusher in the Gulf of Mexico, the company tested and bought several dozen of Costner's devices, which might prove useful in helping to clean waters nearest the coast, but are doubtless unable to solve the larger problem of oil settling deep in the Gulf. His first marriage ended, reportedly, due to Costner's serial philandering. His ex-wife walked away with $80M, one of the largest settlements in Hollywood's long history of divorce. In 2004, Costner honeymooned in Scotland with his second wife, model Christine Baumgartner. During his stay, a masseuse at the hotel was fired after telling her employer that while massaging Costner, he had removed the towel covering his midsection and masturbated. The woman complained to local labor authorities that her firing had been unfair, and she was awarded an undisclosed settlement, while the hotel kept Costner's name out of the papers for two years. The allegations were disclosed by the Daily Mail in 2006, with the legal reminder that the masseuse's allegations were only allegations. Hollywood Walk of Fame 11-Aug-2003 at 6355 Hollywood Blvd.